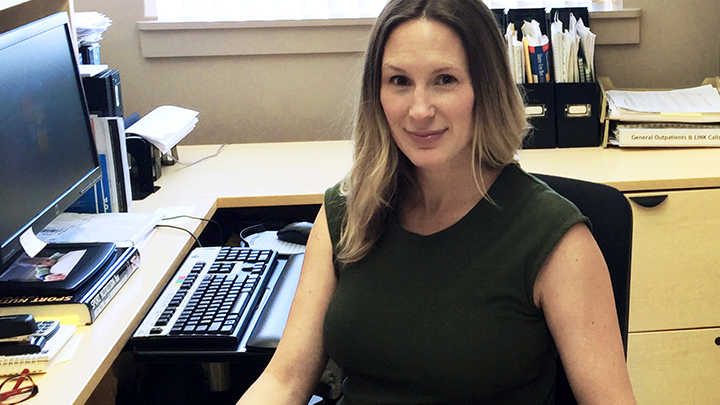 Edmonton-based dietitian Holly Bell promotes the health of all Albertans by answering their nutrition questions on HealthLink. “Variety” is the word that comes to mind to best describe Holly Bell’s job as a HealthLink and outpatient dietitian. She fields questions ranging from infant nutrition and the updated Canada’s Food Guide to celiac disease, diverticulosis and how to optimize nutrition while fighting cancer. “I love to be connected to the latest science about a variety of nutrition topics and am challenged to translate that science into nutrition information that patients can use to make positive changes in their lives,” says Bell. This March 20 marks the 10th anniversary of Dietitians Day, a day set aside to recognize the contributions of our nutrition experts. To highlight the work they do, Nutrition Services has created four videos that feature Alberta Health Services’ (AHS) dietitians with their patients and clients. To learn more about what AHS dietitians do, please watch our Dietitians Day videos.